Many of us have built the Monogram 1/72 A-1E Skyraider. This kit harkens back to the late 1960s, and while a pretty simple kit, is generally accurate, if lacking in detail. There are several aftermarket sets available for it including a cockpit, which will really help. Recently, a new A-1E kit has been produced, but it is quite expensive in comparison and apparently has its issues as well. 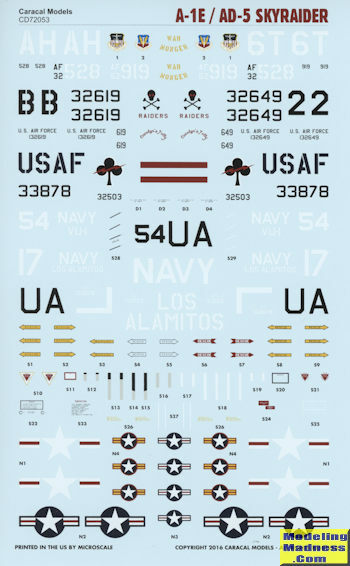 Regardless of which the modeler chooses, we now have a very nice decal sheet that, while designed for the Monogram kit, shoujld fit the new one as well without too much trouble. Included in this set are the following. Next, a VNAF A-1E with the 514th FS at Bien Hoa. Our first Navy plane is an AD-5 with the Naval Air Reserve Training Unit (NARTU) at Los Alamitos. Finally, the very colorful VU-1 AD-5U based at NAS Barbers Point in 1962. The instructions are excellent and provide not only left and right side profiles, but also the upper and lower schemes for all these options. If you have the Monogram kit, then you should seriously consider this one as it will help to liven up your display shelves. Thanks to www.caracalmodels.com for the review sheet. Get yours today from this link or have your local shop order it for you.